Extracting Certain Teeth can Boost Orthodontic Effectiveness - Duane Wolff, D.D.S. Duane E. Wolff, D.D.S., P.C. We treat most malocclusions (bad bites) with braces or clear aligners. But not all malocclusions are alike — some can require extra procedures to achieve successful results. One such example is when incoming teeth crowd other teeth and cause them to erupt abnormally. The crowding also reduces the space needed to move the misaligned teeth to better positions. To make more room we'll often remove some of the teeth before undertaking orthodontics. The key is to extract the right teeth. The best candidates are those whose absence will have minimal effect on both appearance and dental function. That's commonly the bicuspids, located right on the edge of the “smile zone” (the teeth most visible when we smile) between the cuspid (eye) teeth and the back molars. Once we choose and remove the teeth our next concern is to protect the bone at the extraction site.Â The bone in our jaws benefits from the pressure created when we bite or chew. This stimulates new bone cells to form and replace older cells. Without it, as when we have a missing tooth, the amount of bone can diminish over time and affect the success of any future orthodontics. To prevent this, we take care not to damage the gums and bone removing the tooth. We may also install a graft under the empty socket to encourage bone growth. If we've removed teeth outside the smile zone, the resulting orthodontics will move teeth into the opened space. In the end, you won't even notice they're gone. Teeth lost or congenitally missing in the smile zone, though, may eventually require a replacement tooth. A dental implant is the best choice, but it should be put on hold for a younger person until their jaw has fully developed. In the meantime, we can install a spacer or a temporary restoration to hold the empty space and prevent other teeth from drifting into it. This can be incorporated into braces or aligners, or with a removable partial denture or a temporary modified bridge. 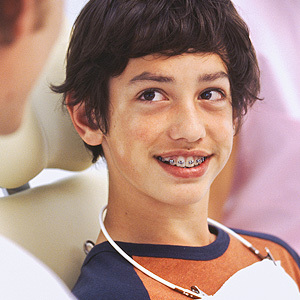 Extracting teeth to aid orthodontics first requires a well-laid plan that could encompass several years. The end result, though, can be well worth the time and effort — better function and a new, attractive smile.